By Scott Gilfoid: Here we are with less than two months away from December 6th, and former IBF/WBA light welterweight champion Amir Khan (29-3, 19 KOs) still doesn’t have an opponent signed up for his next fight on that date. Khan had talked about wanting to fight on December 6th either in the United States or the UK, but it’s becoming increasingly clear that Khan likely won’t be fighting in December. If that turns out to be the case it’ll be the second consecutive year in which Khan has fought only once. Last year, Khan sat out a fight in December because he was hoping to get a big fight against Floyd Mayweather Jr. Instead of Khan getting that fight, Marcos Maidana lucked out and ended up fighting Mayweather twice. 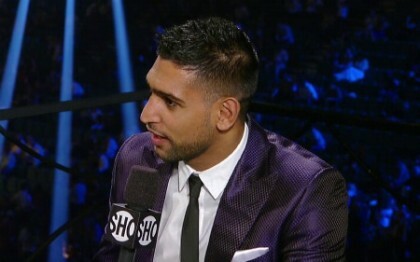 Khan had the chance to fight Devon Alexander last December, but he waited on the Mayweather fight that never happened. Now it’s looking like Khan might skip December again in hopes of getting picked out by Mayweather. There is a danger for Khan if he does fight in December, because boxing fans will won’t him to fight a quality opponent for a change instead of the last three fodder opponents he’s faced since he was whipped by Danny Garcia in 2012. Fans want to see Khan at last fight the likes of Robert Guerrero or Devon Alexander. They really want to see Khan fight Keith Thurman, but that’s probably too much to hope for given the last three opponents Khan has faced. Guerrero or Alexander would be a tremendous step up in class for Khan from the last three guys he’s faced in little 5’5” Carlos Molina, Julio Diaz and Luis Collazo. October is halfway over, and I have a hard time seeing Khan’s adviser Al Haymon putting him in with Guerrero or Alexander by December 6th. We might see Khan sit out and wait on the Mayweather fight to see if it’s going to happen or not. Fighting Guerrero or Alexander would be potentially risky for Khan because those would be basically 50-50 fights due to those two guys having decent talent and power. If Khan is convinced he’s going to get the Mayweather fight next May, then I can definitely see him not fighting again. I hope I’m wrong because I want to see Khan fight on December 6th against a relevant contender instead of another old guy from yesterday. But I think we’re likely to see Khan sit out and wait on the Mayweather fight. If Khan doesn’t get the Mayweather fight, it’ll be another important fight date he’ll be missing out on.